“Our days are going to be long and our work is going to be hard, but when you leave here, you will also be refreshed,” said Sharon Leslie Morgan in greeting her fellow truth-tellers and truth-seekers on Friday. 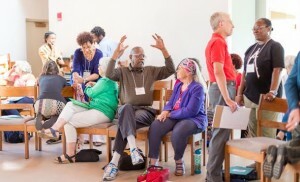 From Georgia, New York, Oregon, Illinois, Arizona, Colorado, Ohio, Hawaii and around the United States: more than 90 people have come to Eastern Mennonite University for the four-day [June 9-12] National Gathering of Coming To The Table (CTTT), an organization that brings together descendants of the enslaved with the descendants of slave owners. Their introductions in the opening circle included a current residence, followed by, sometimes, a litany of locations using the phrase “by way of,” tracing genealogies several hundred years into the history of this country. “I am from the future by way of the past,” said one creative participant, to a wave of laughter. “We hoped that we could help bring families together to fulfill Martin Luther King’s dream that ‘the sons of former slaves and the sons of former slave owners will be able to sit down together at the table of brotherhood,’” Hairston told the group, quoting the words of CTTT’s mission statement. The organization is flourishing. Twelve chapters around the country exist, with three on the west coast, and others in Richmond, Virginia; Annapolis, Maryland; Boston, Massachusetts; and the Raleigh/Durham area in North Carolina. A three-day leadership training institute earlier in the week was filled to capacity. 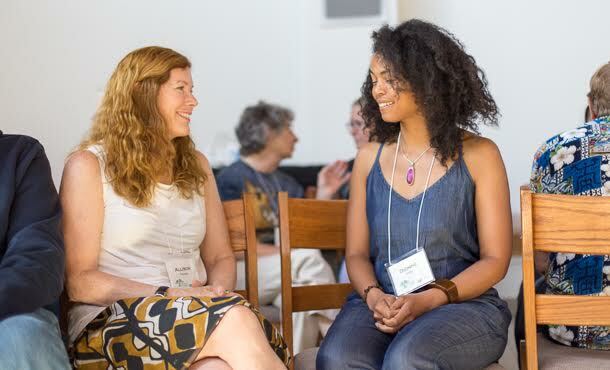 The gathering itself continues through Sunday with seminars and workshops around the topics of chapter creation and strengthening, genealogy, writing workshops, forgiveness and reconciliation, and restorative justice, among others. “This is the one time that we can bring people from around our community together face to face to work on the mission and vision,” said executive director Tom DeWolf, who resides in Bend, Oregon, and has been involved with CTTT for 10 years. DeWolf and Morgan are co-authors of the award-winning memoir “Gather At The Table: The Healing Journey of a Daughter of Slavery and a Son of the Slave Trade.” DeWolf has also written a book, “Inheriting the Trade,” about his family’s legacy in the slave trade, while Morgan is the founder of OurBlackAncestry.com. The organization, founded in 2006, “values the sharing of personal, family and community stories as a powerful vehicle for uncovering history, building relationships, healing wounds and inspiring action,” according to its website. Initial funders were the Fetzer Institute and the W.K. Kellogg Foundation. “We’re talking about acknowledging the fact of this reality in our country, acknowledging the consequences, the implications and ultimately the feelings. That’s the schema of overcoming denial,” she said. 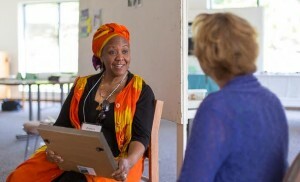 On Friday evening [June 10] from 7-9 p.m., Edda L. Fields-Black hosted a discussion about writing the libretto for “The Requiem for Rice,” a classical music piece written for the repose of the souls of the dead of Africans enslaved on rice plantations in the South Carolina and Georgia Lowcountry. She is collaborating with internationally renowned artists, visual artist Jonathan Green and filmmaker/director Julie Dash. Fields-Black discussed the work and read portions of the draft of the libretto. Sending my love and congratulations to everyone there. I wish I could be there with you, but the universe had other ideas. May the work continue on into fruition! Wow this is extraordinary. What incredible strides have been gained in healing the wounds of multi-generational trauma on both sides. And idea whose time has come. 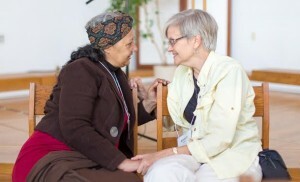 I learned so much in so little time among so many patient and loving souls. I am blessed!